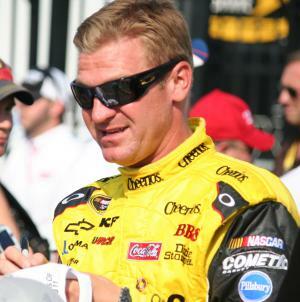 Clint Bowyer was born on the 30th May 1979, in Emporia, Kansas USA, and is best known for being a professional stock car race driver, who currently drives the No. 15 Chevrolet SS for HScott Motorsports and competes in the NASCAR Sprint Cup Series. He has also competed for Richard Childress Racing, Michael Waltrip Racing, and he participated in the 2008 Nationwide Series championship which he won. Have you ever wondered how rich Clint Bowyer is, as of mid-2016? According to authoritative sources, it has been estimated that the total size of Clint’s net worth is as high as $30 million, with the main source of this amount of money being his successful involvement in the sports industry as a professional NASCAR driver. Additional to this, he has also appeared in a number of TV shows, which have also added a lot to his net worth. Clint began to race when he was only five years old, and he was quite successful, lifting the first place trophy 200 times in the following eight years. His professional career began in 2004, when he was spotted by Richard Childress, and he immediately offered Clint a place in his team. In his debut season his most notable results were second places at the Phoenix and Auto Club Speedway, however, until 2007 he didn`t have any major results, but that year he won the NEXTEL Cup race, and he also had several victories in the Busch series on the tracks Circuit City 250, and Bashas’ Supermarkets 200, which largely increased his net worth. Since his first race in the NASCAR Sprint Cup Series in 2005, he has raced in 375 events, winning just eight of them, but finishing 166 times in the top ten. His best championship finish was in 2012, while driving for the Michael Waltrip Racing, when he was second behind Brad Keselowski. However, Clint has been better in the NASCAR Xfinity Series, participating in 180 races, and winning eight of them, and finishing 115 times in the top ten. His best championship finish was in 2008, while driving for the Richard Childress racing, when he topped all other drivers. His net worth also increased from his own racing team, Clint Bowyer Racing, which competes from 2008, and features racers Dale McDowell, and Shannon Babb. In 2016, he signed a contract with the HScott Motorsports, which has also added to his net worth. Clint is also recognized as an actor, appearing as himself in several TV series, including “Duck Dynasty” (2012), “Diners, Drive-ins and Dives” (2013-2015), and “The Soup” (2015), among others, all of which have added to his net worth. When it comes to speak about his personal life, Clint Bowyer has been married to Lorra since April of 2014; the couple has a son. In free time, he enjoys watching baseball, as he is a big supporter of the Kansas City Royals team. Clint is also known for his charity work; he was the host of Clint Bowyer Charity Golf Event, and he works as well with other organizations, such as the Emporia Community Foundation among others. Place Of Birth Emporia, Kansas, U.S.
1 Son Cash Bowyer born on October 1st 2014. 2 Expecting 2nd child with his wife Lorra a little girl in late 2016. 3 NASCAR Nationwide Series driver. $30 million 1979 1979-5-30 Actor American Cash Aaron Bowyer Chris Bowyer Clint Bowyer Clint Bowyer Net Worth Emporia Gemini Jana Bowyer Kansas Lorra Bowyer May 30 U.S.